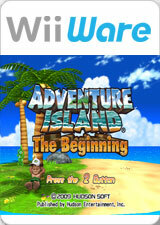 Adventure Island: The Beginning is a platforming video game released for the Wii's WiiWare service. It was developed by Hudson Soft and is the latest installment in the Adventure Island series. The game features gameplay similar to the Nintendo Entertainment System version of Adventure Island, but with a 3D graphics makeover. Players control Master Higgins, running and jumping through levels and dispatching enemies with axes, boomerangs and spears. They must also collect food items in order to maintain a constantly depleting vitality meter. Players can also upgrade their abilities and weapons by finding golden melons and trading them in at a shop on the overworld map. The game also features four minigames, including skateboarding (that uses the motion sensing of the Wii Remote), axe throwing and a virtual re-creation of Hudson's 16-Shot handheld gaming device, which measures how many button presses a player can achieve in a second. The graph below charts the compatibility with Adventure Island: The Beginning since Dolphin's 2.0 release, listing revisions only where a compatibility change occurred. This page was last edited on 20 April 2018, at 15:47.